With Father’s Day being celebrated in June, what is one of the best gifts we can give dad as he ages? We can help dad choose a living environment that helps keep him independent and in his home for as long as possible. I don’t know anyone who “wants” to live in a nursing home environment and many times that’s the barrier for people to consider senior housing as a viable housing option. Many people think that if they move to a retirement community they are taking one step closer to living in a nursing home. What many people fail to realize is that by moving to a continuing care retirement community they are taking steps to maintain their independence. By choosing a senior living environment, many different items are available for dad’s assistance and benefit that will keep him living an independent lifestyle longer than he would in his own house. The first and primary benefit is the social connections. Research has shown that isolation is a key contributor to cognitive decline, stroke and other conditions, according to Dr. Karl Pillemer, professor of gerontology in medicine at the Weill Cornell Medical College. These social connections stimulate our minds. As humans, we are designed to live around other people and thrive off the interactions that we have with them. Look for senior living options that help keep people engaged and interacting with others with social events like supper club and breakfast club, theatre trips, musical events, book clubs, craft clubs and game nights. There are also other benefits to a senior living community that help keep dad independent for as long as it is safe for him to do so. Make sure senior living communities you’re considering include handrails for stability when walking, elevators so that he doesn’t have to take the stairs and grab bars in bathrooms. All these devices help reduce tripping and falling which are one of the biggest culprits when it comes to sending people to a nursing home. Ask communities if there is a nurse on site to help people with medication management, medical record-keeping, blood sugar monitoring, wound care and pacemaker checks, among other preventative measures. In addition, make sure there is an emergency call system in place so that dad can alert the nurse if he doesn’t feel well or needs help. Finally, ask the places you’re considering if they provide healthy and nutritious meals on site or in dad’s residence. Many times people don’t eat like they should, they get malnourished and then their medications don’t work properly. At John Knox Village East, we are able to delay nursing home care for about 4 years for those people who live in our Independent Living apartments when compared to people who continue to live in their family house. While the goal should be to keep people as independent as they can be for as long as it is safe for them to do so and for as long as they feel safe in their environment, ask the communities you’re looking at what happens if dad needs higher levels of care like assisted living or skilled nursing. Making a major move can be upsetting and stressful to dad. By choosing a continuing care retirement community, you can help reduce this stress because if dad needs higher levels of care, the move is a simple one down the hall, rather than a more involved move to a different environment or a different town. 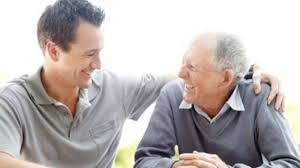 By simply moving to a different area of the community, dad can maintain his friendships and keep up those social connections that are so important at maintaining is quality of life. Dad has worked hard to provide a good life for his family. Dad takes pride in being self-sufficient and being able to take care of himself. By choosing a senior living community that helps dad keep his independence, he is continuing the standard he has set for himself. He is putting a plan in place to play an active role in choosing how and where he ages. Helping dad make this choice is one of the best gifts you can give him this Father’s Day. By making this choice, dad is giving his family the gift of not having to worry about here he’ll live or where he’ll receive care as he ages if he needs it. Call us at 660-584-4416 to find out how we can help you plan for dad’s future and help him maintain his independence.